Choose this issue for articles on travel photography, a masterclass with Richard l'Anson, geotagging, adding location to your EXIF data, trigger action, and shooting with movement and sound. 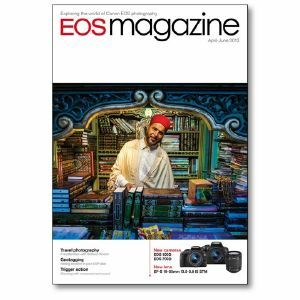 Latest news from Canon and details of seminars to be held at EOS magazine headquarters. Patience and perseverance are prerequisites for outstanding wildlife images, says Ben Hall. Firmware updates for the EOS-1D X, 5D Mark III and EOS C500, C300, C100 cinema cameras. In five short weeks Julian Love tested Canon photographic gear worth over £100,000. Details of the EOS 100D, the EOS 700D, and the EF-S 18-55 mm f3.5-5.6 IS STM lens. We explore the new basic zone modes and find out how useful they are. Richard l'Anson shares how to capture the reality of a city or country in your travel images. Ways you can get your camera to photograph those hard to capture subjects automatically. EOS cameras have a few clever features to help you produce powerful compositions. Canon's Digital Lens Optimizer (DLO) helps you to get the very best out of your lenses. Drew Buckley compares the attributes of the EOS 7D, 5D Mark II and 5D Mark III cameras. Scott Sharman uses Speedlites to turn an overcast day into a dramatic shoot. Find out how you can put the Global Positioning System (GPS) to work for your images. How and why you might want to use an old FD lens with your EOS camera.